Just a few quilting projects on the go this week. 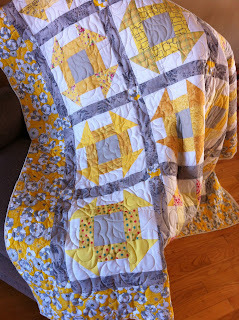 My yellow and gray quilt came back from being quilted, so I am adding the binding today. These two quilted table runners are also at the binding stage. 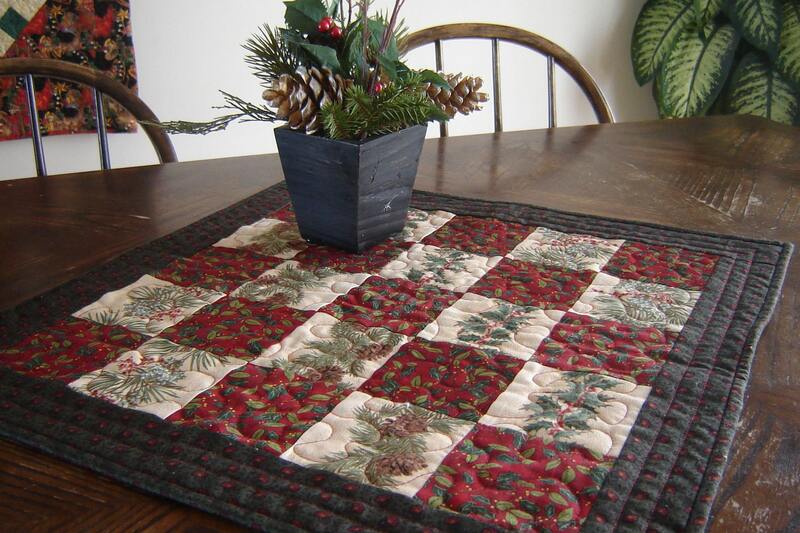 The cherry runner is free-motion machine quilted with a leaf motif that I wanted to practice. It's not perfect, but I think that leaves in nature are not always perfectly formed either, so it just adds to the character of the finished piece. I added a little folded accent strip just inside the quilt binding and think it really pops! The lovely zig zag chevron quilt was made from a beautiful floral fabric I've had for quite some time. When I bought it, I was reminded of my Oma (grandmother) who passed away when I was quite young, but she wore dresses with these big floral prints. I found 2 fat quarters of it in my fabric stash, so this quilted table runner is a bit larger than some of the others I've made recently. Do you buy fabric or decor items because of pleasant memories they bring back? 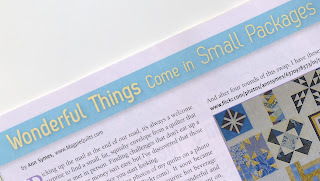 Finishing touches are the little details that will determine is your quilt is made to last through many washings or if it is made to be a delicate treasured keepsake. 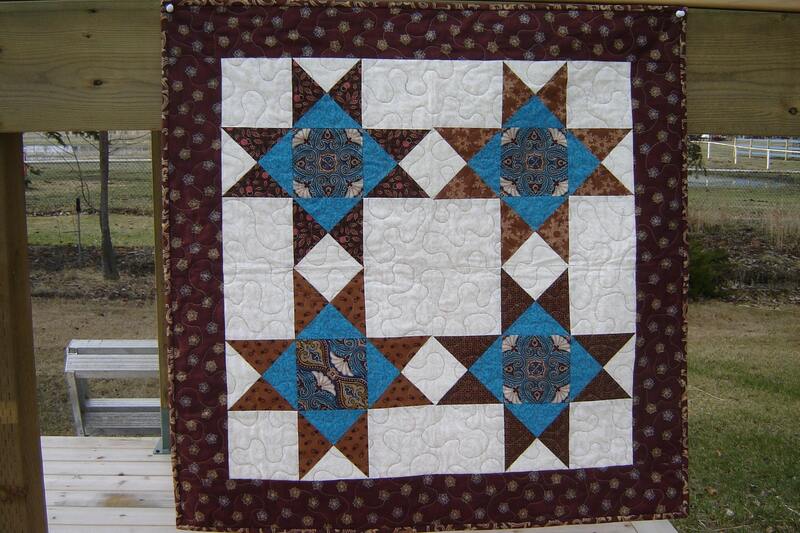 Some quilts are finished with a scalloped edge, but most are finished with a straight edge. Corners should be square and edges should lay flat, not wavy. 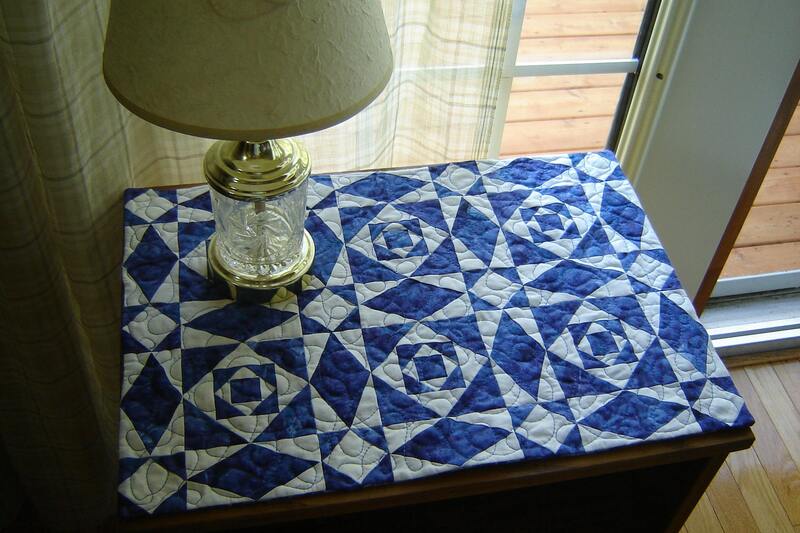 Quilts can be finished pillow-top style which gives the least durable edge, but is relatively easy to do and works just fine for quilted table runners or potholders or items that won't get a lot of wear along the edges or for an odd-shaped quilt that would be difficult to finish another way. This technique is done before quilting by layering the batting with the backing on top, right side up, and the quilt top right side down on top of the backing. These layers are stitched all the way around the outside of the quilt, leaving an opening to turn the quilt right side out. After the quilt is turned, the opening is stitched closed, either by hand or by machine. 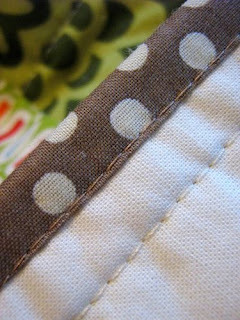 The most common way of finishing the edge of the quilt is with binding. Some quilts are finished with just a single fold binding, but double fold binding is more durable. There are 2 methods of applying binding. 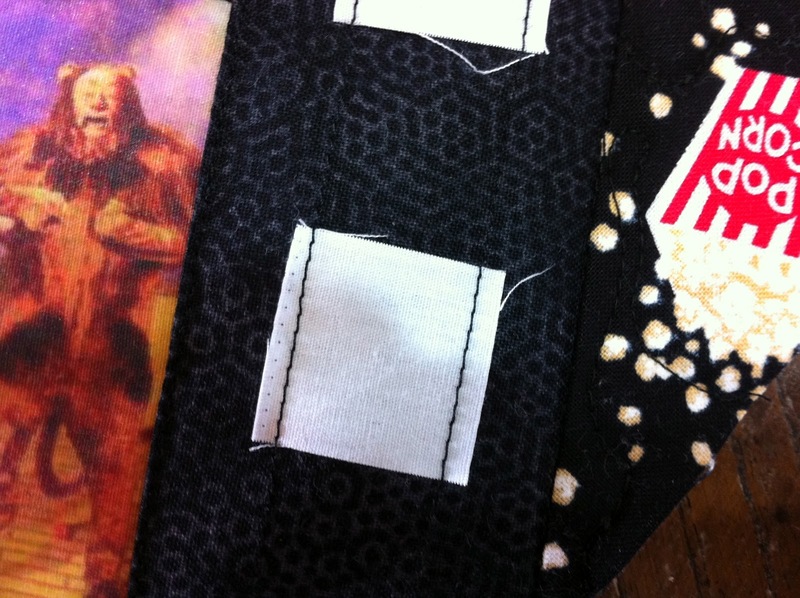 The first is to sew the binding to the front and to hand-sew the binding to the back, leaving no visible stitching to see how the binding was attached. The second is to sew the binding to the back of the quilt, turn it over to the front and machine stitch it down with either a straight stitch or a decorative stitch. This is definitely less time intensive than the first method, but both are equally durable. And finally, your quilt should come with a label that has, at minimum, the quiltmaker's name, the date the quilt was made and where it was made. I hope that this little series is helpful as you look for and purchase quilts. If you have any questions that I didn't answer, please leave a comment! 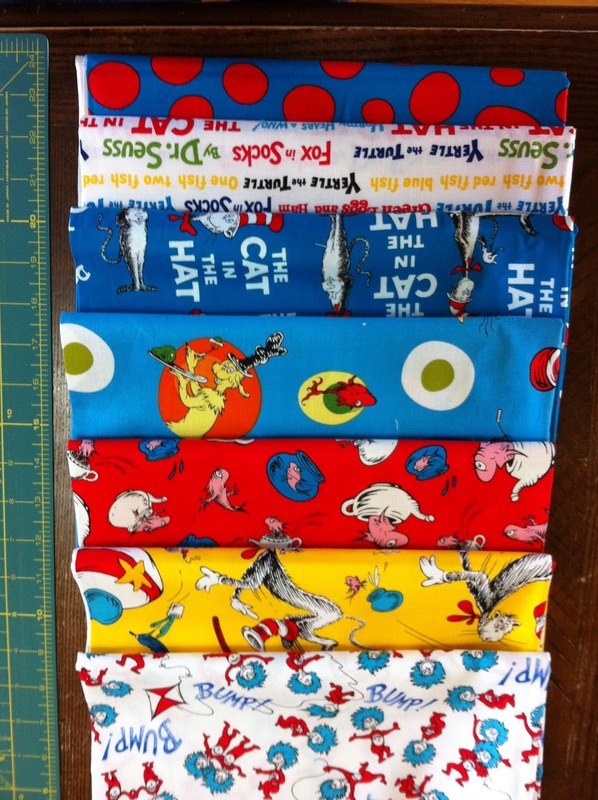 One of the most viewed items on my blog and in my Etsy shop has been my Dr. Seuss quilt. I made two late last fall and both were sold quickly. I love piecing these baby quilts as I think about the Dr. Seuss stories that I read to my kids when they were little. Some of my favourite times with them were reading stories and now I get to read to my grandkids! Cutting up Thing One and Thing Two! After cutting up Dr. Seuss, I took a quick trip to the mail box at the end of the road and found all kinds of quilting goodies! I've been waiting since the beginning of February for this special fabric to make my mini quilt for my swap partner. The theme for Feb/Mar swap of the MiniQT group on Flickr was movies. Sneak peeks are just beginning to be posted. The popcorn fabric was bought locally. Can you guess what movie my swap partner loves? I would love to show you the whole quilt, but that will have to wait until this mini-quilt makes it to its new owner! What are you working on today? Do you participate in swaps? Challenges? Always on the look out for small projects that can be made up quickly for gifts, I found this pattern for luggage tags from Linda Hubbard and Gail Mitchell from Fredericton, New Brunswick, Canada. I picked out fabrics from what I had on hand, found some heavy duty interfacing and sat down to sew one for a friend. Disclaimer - the pattern linked to is perfectly fine. The problems that occurred are because of my own stupidity! Something was not quite right! The tag looked too narrow! I re-read the instructions and realized I had the wrong seam allowances. Then I had a brilliant idea that I could sew the plastic on BEFORE sewing everything together, thinking that the stitching wouldn't show on the backside if I did that. The stitching didn't show, but it was extremely difficult to turn right side out, and when I did get it turned, the plastic was all crinkled and messy. It was then I realized that I couldn't even press the tag flat properly without melting the plastic and making a mess of my iron and ironing board. So, attempt #2 - FAIL! Even with all that, it looked like it could be a usable luggage tag for my own luggage, so I finished as best I could. And then, as I put my business card into the plastic sleeve, I realized I messed up AGAIN! The sleeve is sewn around 3 sides with an opening to slide an info card in. When my luggage tag is on my luggage, the card will just fall out as the opening is on the wrong end of the tag! I was all out of my chosen fabric and still didn't have a usable luggage tag! This project will need a do-over at another time when I am in a better frame of mind! Have you ever made a project that just wouldn't turn out? Did you make it work? Or just start over? When looking at quilts, there are a few variations and combinations of techniques that will make a quilt more or less labour intensive. 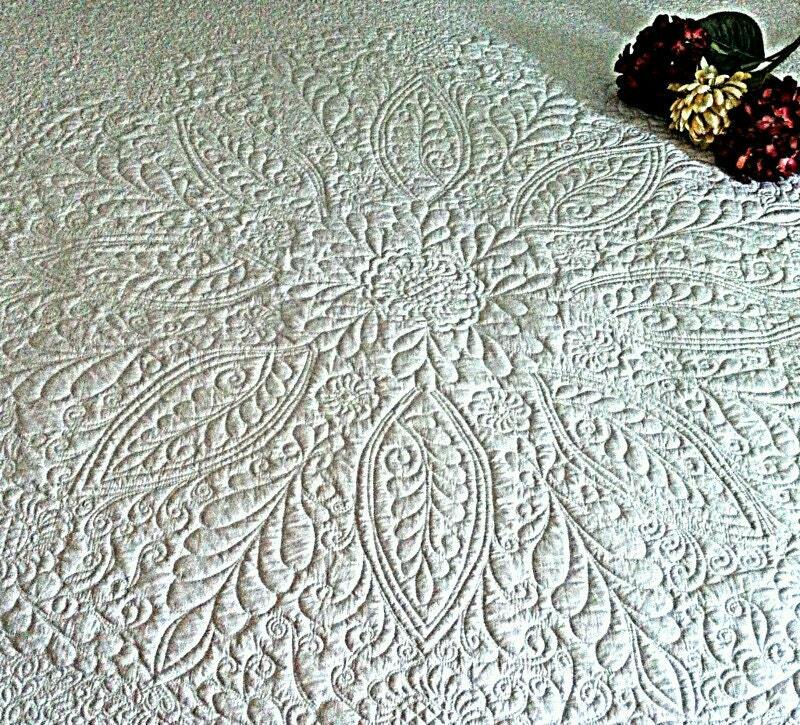 A whole cloth quilt will be made up of one fabric, usually a solid white and the only design detail will be the quilting that is done to make up the pattern. 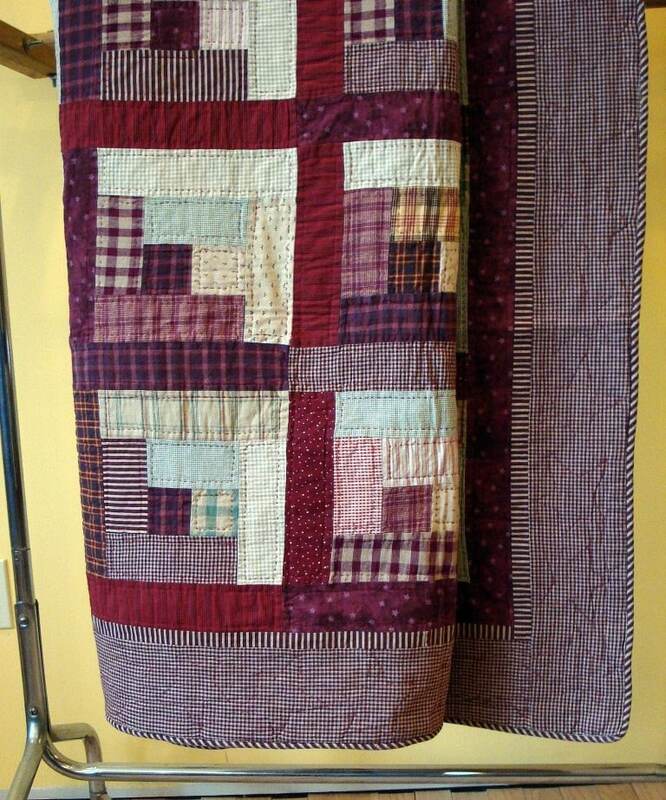 Whole cloth quilts may be quilted by hand or by machine. A pieced quilt will be sewn by machine, or occasionally by hand with the pattern coming through with the fabrics chosen. In its broadest sense, an appliqué is a smaller ornament or device applied to another surface. An appliqué is usually one piece. In the context of ceramics, for example, an appliqué is a separate piece of clay added to the primary work, generally for the purpose of decoration. The term is borrowed from French and, in this context, means "applied" or "thing that has been applied." 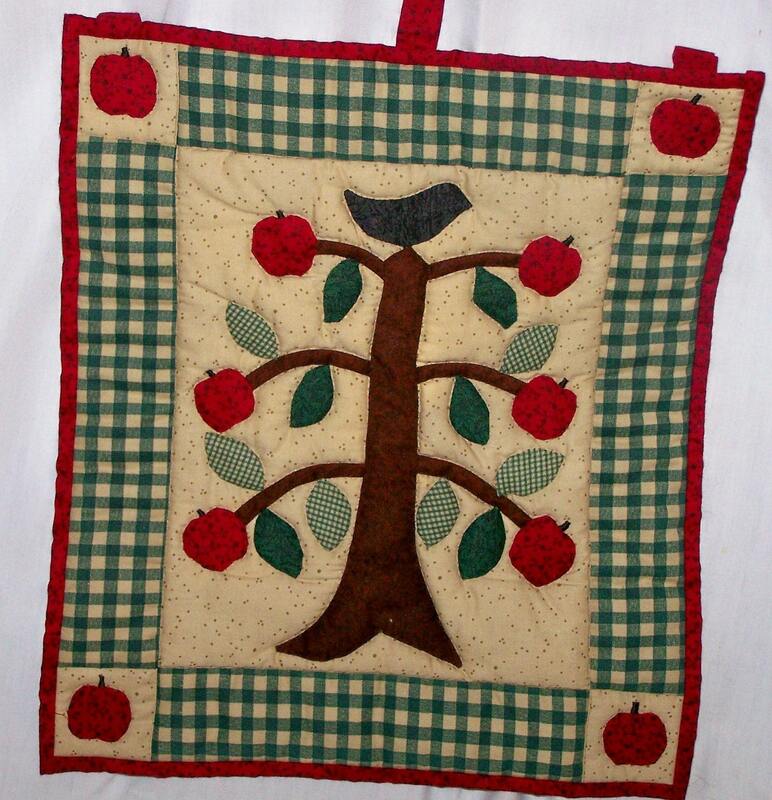 Applique can be very simple, as seen in primitive style quilts, or very elaborate as seen in Baltimore Album quilts. 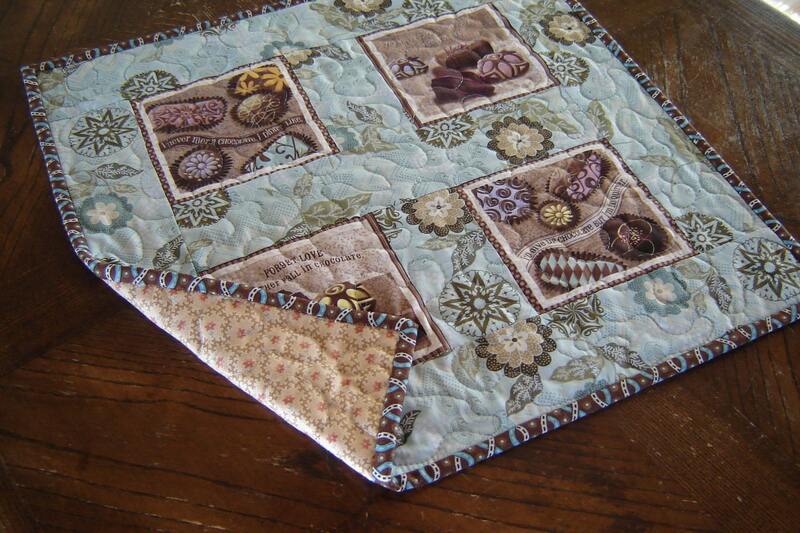 And if that isn't enough, there are many ways to apply the applique shape onto the surface of a quilt. 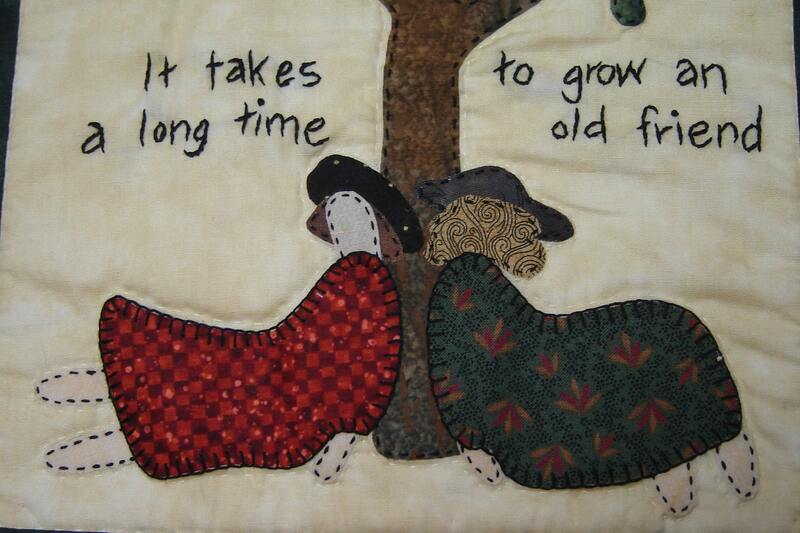 There is hand-applique, where each piece is stitched by hand, piece by piece to the quilt top. 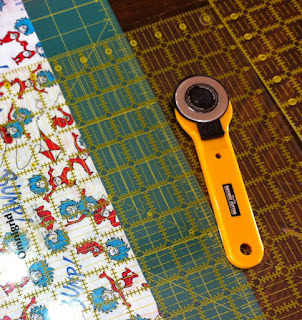 There is machine applique, where a decorative sewing machine stitch (or even just a straight stitch) holds the applique piece to the quilt surface. And then there is fused applique, where the fabric is backed with a special fusible product and is ironed to the quilt surface. Fused applique can be left as is for a quilted wall-hanging or piece that is not going to be washed often, or it can be made more durable by the addition of machine stitching or hand stitching. 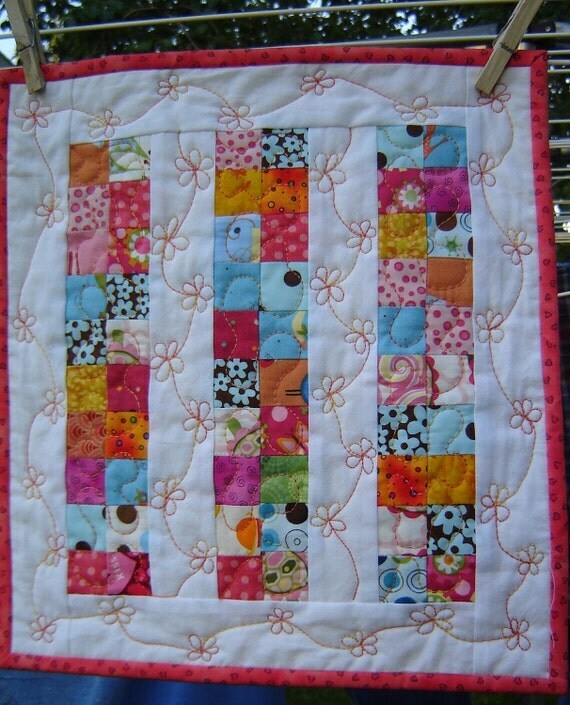 Some quilts will also feature different embellishments such as adding beads, embroidery or other surface decoration. 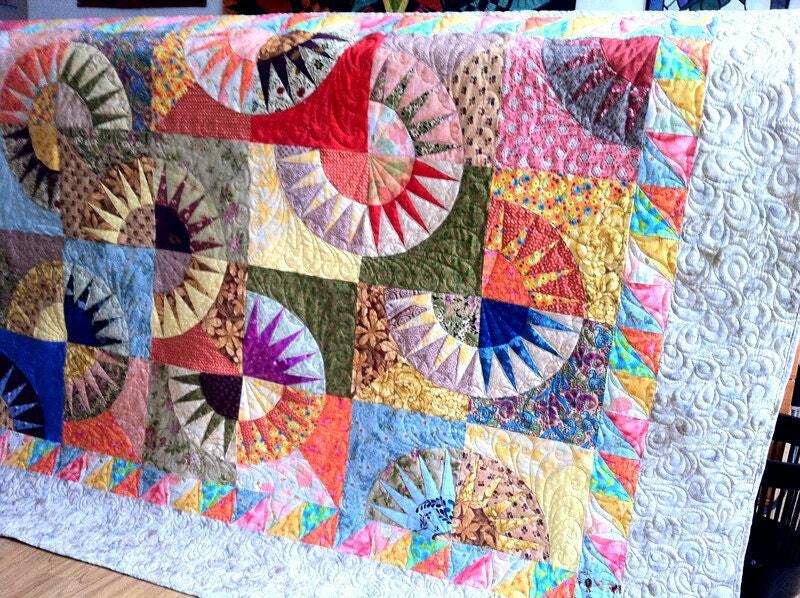 Depending on the size of the quilt and the type and detail of such embellishments, cost of such decorated quilts can go up substantially from a plain, simple quilt. Just a quick update on the custom wedding quilt. I love, love, love how this is going together! And this lovely table runner is in Singapore! I love how Etsy makes it easy to sell online all over the world! 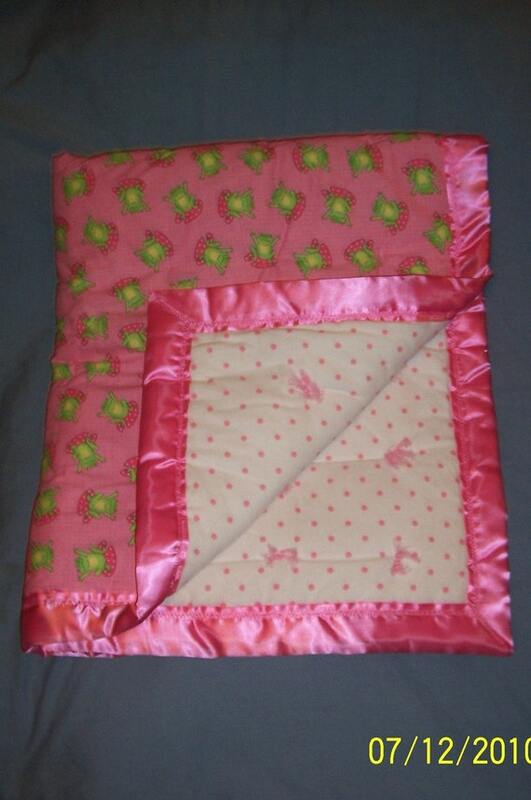 Selling quilts online has been an education for me. Quilts are such a tactile item, that's it's difficult to describe design details or to convey the texture and feel of the quilt. In discussions on how to effectively sell quilts and what price to list them at, it becomes readily apparent that unless you are a quilter, it is difficult to know why one quilt is listed at a much lower price compared to another quilt that is listed at a higher price point. 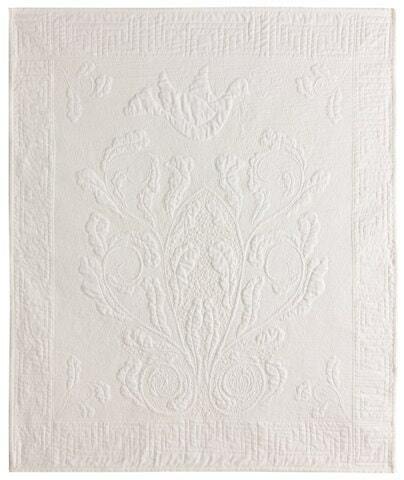 The first consideration when looking at a quilt is the design. Generally, more pieces = more expensive. 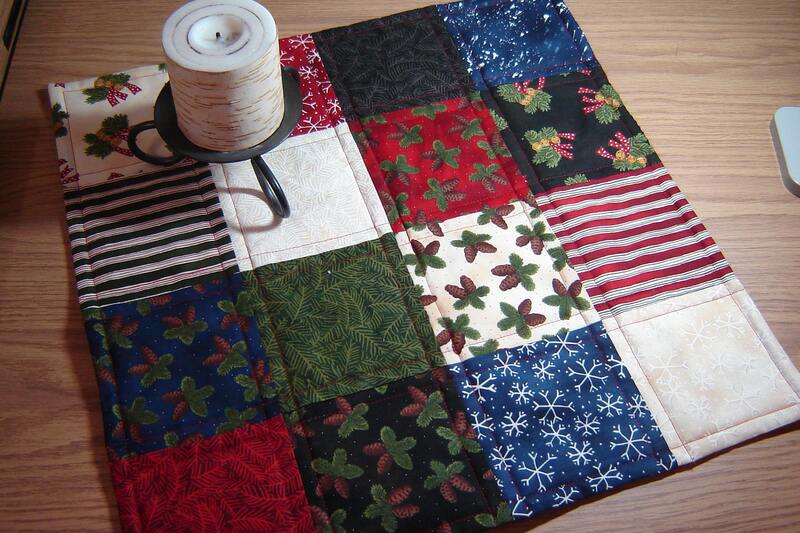 As the pieces of fabric in a quilt get smaller, there is more sewing involved, therefore more labour intensive. The first quilt below would be an easier quilt to piece and the second involves more piecing because the four star blocks have many pieces of fabric to be sewn together. In designing and making a quilt, there are also different shapes that range from easy to very difficult to piece. The simplest quilt would be one made from a pre-printed panel that involves no piecing, just quilting and finishing. Moving up the difficulty scale is patterns consisting mainly of squares and rectangles. Then add a few triangles to increase the difficulty and finally, curved seams. 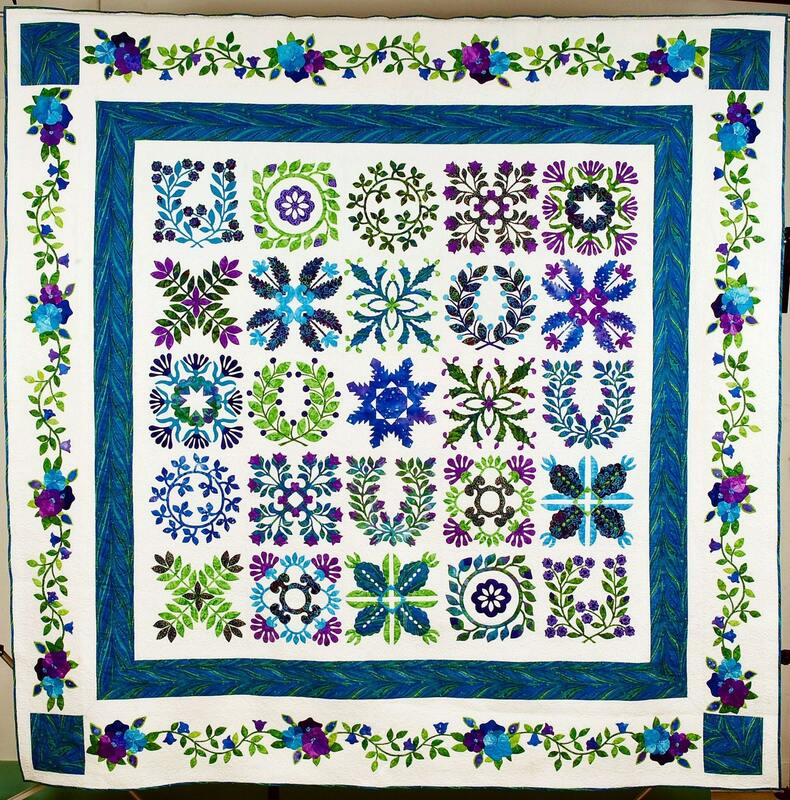 Some quilts will be made from traditional patterns and blocks, while others will be original designs and feature complex piecing. If you are having a hard time picking out shapes and forms, you are probably looking at something original and can expect it to be priced accordingly. Art quilts are as individual to the artist as any art form and many of these quilts are one of or limited editions. So, without getting long-winded, that's the basics on quilt design and level of difficulty. There are many variations within each category and always the quilts that don't fall into any category, so look carefully at the quilts you are thinking of purchasing and learn to recognize and compare levels of difficulty.